Kuala Lumpur Bird Park (KL Bird Park) is the world’s largest free-flight walk-in aviary. It is no wonder why the Park consistently makes it to the lists of top things to do and see whilst in Malaysia’s capital city. Lonely Planet recommends it. TripAdvisor recommends it, and even big third party online agencies like Expedia recommend it too in their Malaysian Interactive Guide. Being a local however, means that I'd been skipping the park every time I pass through the area, at least until recently. The reason was simple. KL Bird Park is located in a rather central area that is popular among tourists, both local and foreign. Nearby, there’s the historic Kuala Lumpur Railway Station, the unique & beautiful Masjid Negara (National Mosque), Islamic Arts Museum Malaysia (one of the best museums in Malaysia, if not in the region, if I may say so myself), the underrated Royal Police Museum, and Tun Abdul Razak Memorial. If you’re not into architectures and museums, then there’s Butterfly Park just next door, Orchid Park and Hibiscus Garden across the street, and KL Deer Park in the nearby Perdana Botanical Garden. There are just simply too many places to visit and enjoy in the area. Thus to give KL Bird Park a proper recognition, I thought I should allocate at least 2-3 hours inside the Park, which was what I did when I went to capture some footage for my “Explore Kuala Lumpur in 360°” video. I also went back to the Park again, albeit briefly, a couple of months after that first visit, during the “Eat Travel Write Doodle Citrawarna” trip. Walking around the huge park - it is almost 21 acres in size, by the way - and watching all the different varieties of birds are just pure fun, more so if one enjoys bird-watching and some photography. The photo opportunities offered at the Park are simply limitless, and start right from the moment you enter it. It is said that there are more than 3,000 birds at the Park, which is divided into 4 different zones, with 3 of them being free-flight zones. With a large section of the Park being a free-flight zone, there are plenty of prospects for some hands-on fun. Children would definitely enjoy chasing peacocks, milky storks and egrets, among others, and be awed by the majestic hornbills and eagles, mysterious-looking owls, pinkish flamingos and colourful rainbow lorikeets and parakeets. The best times however probably would be bird feeding times, which are scheduled throughout the day, with lories, ostrich and hornbill feeding times in the morning and eagle and milky stork feeding times in the afternoon. So whether you choose to come here in the morning or in the afternoon, be sure not to miss these feeding times. The latest timetable should be available on their website. A family/group photo session at the World of Parrots is also a must (although this would cost extra on top of the entrance fee). Here are a few more photos that I took when I was at the Park. 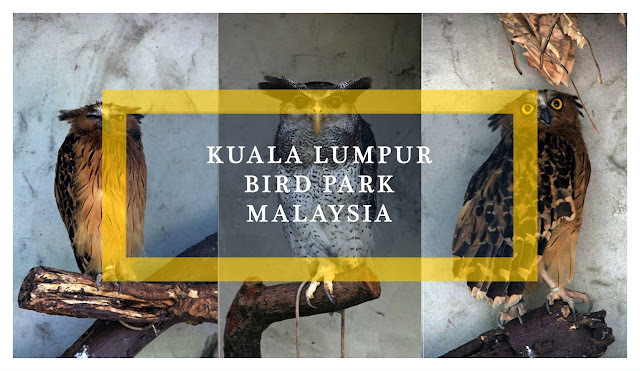 All things considered, I believe Kuala Lumpur Bird Park certainly deserves its place as one of the top attractions in Kuala Lumpur and definitely warrants at least a half-day visit. I only wish that they offer a discounted combo ticket, which combines entrance to both the Park and Butterfly Park next door, as this would make an even more awesome day-out in the city. In the meantime however, if you’re planning to make the trip to the Park, don't forget to check their official website first as they do have promotions and offer discounts from time to time. As mentioned earlier, Kuala Lumpur Bird Park is listed as one of the recommended places to visit/things to do in Kuala Lumpur by Expedia Malaysia. Check out Expedia Malaysia Interactive Guide to see what else is there to do (and to eat!) in the city and other major tourist destinations in Malaysia. Have you been to KL Bird Park or somewhere similar? What do you like most about it? Or do you rather skip places of attractions like this? Going to Kuala Lumpur, Malaysia? Do check out these Kuala Lumpur hotels for your accommodation requirements there. You have captured some great photos of birds in the KL Bird Park! I enjoy photographing birds, but it has always been difficult to get close enough. I am not a professional photographer, but now that I have a zoom lens on my iPhone 7 Plus I think I may be able to get better shots. Thanks, Howard. I'm not a pro either, just took some photos using my camera with a kit lens, heh! The best thing about KL Bird Park is that you can try to get close with not so much problem. iPhone 7 Plus has some great camera features btw, sometimes I feel like ditching my camera for an iPhone. Thank you. If you love bird photography, you'd love KL Bird Park! I love these birds! What a fantastical and tranquil place to visit right in a tourist area. Looks fun. Wow! They do have a good variety of birds. I am imagining the photo opportunity there. Great pics. Thanks, Indrani. With over 3000 birds in the park, they sure have plenty of variety there and limitless photo opps! I could have just stayed there the whole day taking photos and it would still won't do the place any justice. Sometimes people give places like these such a hard time, but I think zoos and parks like this where we have opportunities to interact with animals we never otherwise would help us to care more about them and protecting their environment. So I do visit bird parks and zoos. I totally agree with you but I think it still depends on how the zoo/park is managed. If it's well managed and the animals get to live in an environment that is as close as to their natural environment, then that's good. That's why I have no problem writing about and recommending Kuala Lumpur Bird Park here. Next year i m going to Myanamar and KL and hence have bookmarked ur post for future ref. Thanks. Woot woot! Nice to know that you're heading this way next year! Hope you'd have a great time! Excellent photos of the birds here. I didn´t knew that Kuala Lumpur has this park. Good to know. Thank you. The areas surrounding this Bird Park is very nice with plenty of different types of parks to suit anyone visiting the area. We're huge bird nerds, so this would be the perfect place for us - we love visiting bird sanctuaries and parks in different parts of the world, and bird spotting out in the wild when we can too. Thanks for the write up - will be sure to visit when in KL! Ah-ha! In that case, I think you'd love, love, love KL Bird Park! And possibly Kuala Lumpur Butterfly Park, just next door, too! Great photos! I can see why the KL Bird Park is recommended by so many people--it really does look great. I can't believe how big it is, I could definitely spend a few hours exploring. We will definitely have to check this out when we make it to KL, hopefully soon! Thank you! I was surprised myself. Previously has been wondering why it's so highly recommended but now that I've been there twice, I would definitely recommend it to everyone else too!